March | 2015 | 50 Westerns From The 50s. 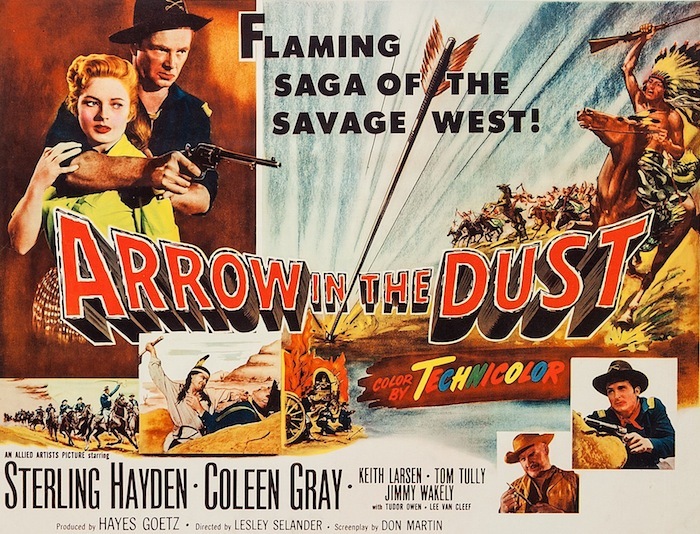 50s Westerns DVD News #177: April From Warner Archive. Warner Archive has some great stuff promised for April. This is one I’ve been wanting for a long time. 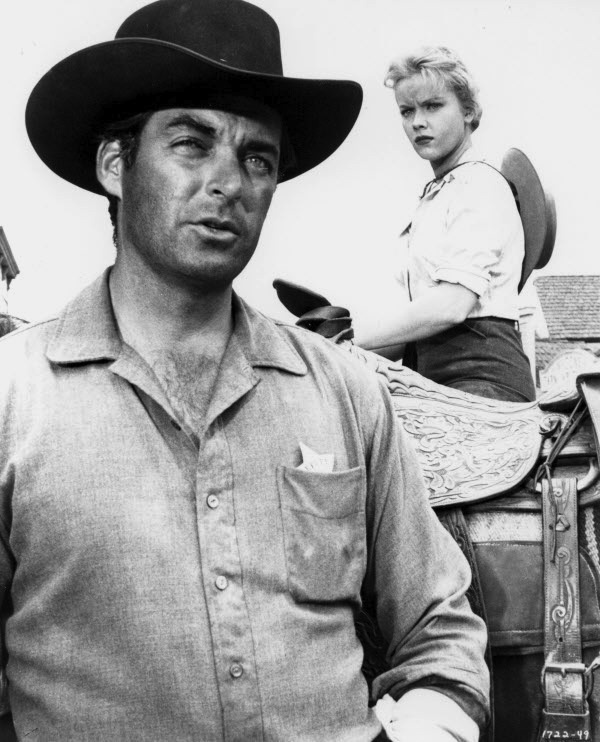 Black and white Scope with Rory Calhoun and Anne Francis, directed by Ray Nazarro. What’s not to like? A solid Montgomery Western written by character actor Leo Gordon. Hayden and Gray appear together a couple years before The Killing (1956), directed by the great Lesley Selander. Duryea as the bad guy gets first billing. Enough said. Peggie Castle and Regis Toomey in 70 minutes of Cinecolor from Allied Artists. Battle Cry (1955). Mister Roberts (1955). The Sugarland Express (1974). Thunderbolt And Lightfoot (1974). Norma Rae (1979). Gregory Walcott was in some very good films. But he’ll always be known for having the lead in Ed Wood’s Plan Nine From Outer Space (1959). Born in Wendell, North Carolina — just a few miles from where I’m typing this, Walcott hitchhiked to Hollywood after a couple years in the Army. Before long his film career was off and running. 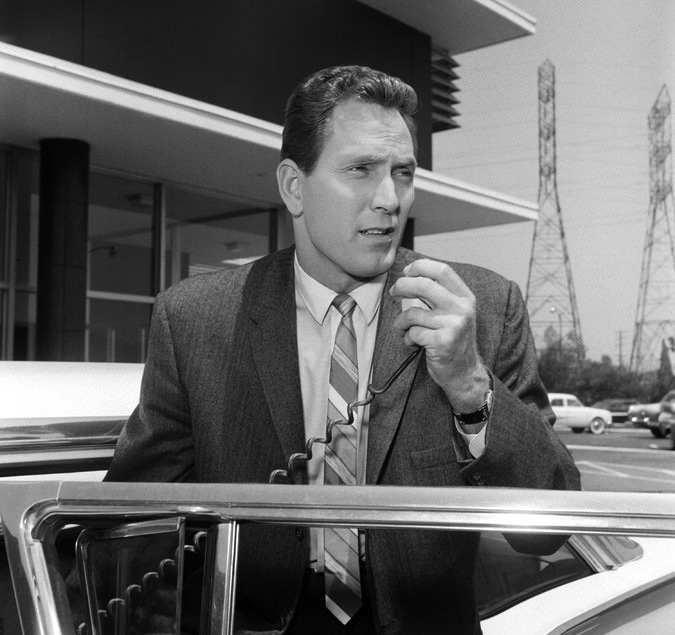 His 50s Westerns include Strange Lady In Town (1955), Thunder Over Arizona (1956) and Badman’s Country (1958, a Fred F. Sears/George Montgomery picture I just watched last week). His TV credits are a mile long, including a couple episodes of The Rifleman and a lead role in 87th Precinct (above). Allow me to take a second to be a proud dad, 50s Western style. My wife Jennifer and daughter Presley were walking around the flea market at the NC State Fairgrounds this weekend. A dealer friend asked where I was, since he was trying to track down a John Wayne movie with a character named Colorado — or some other state. 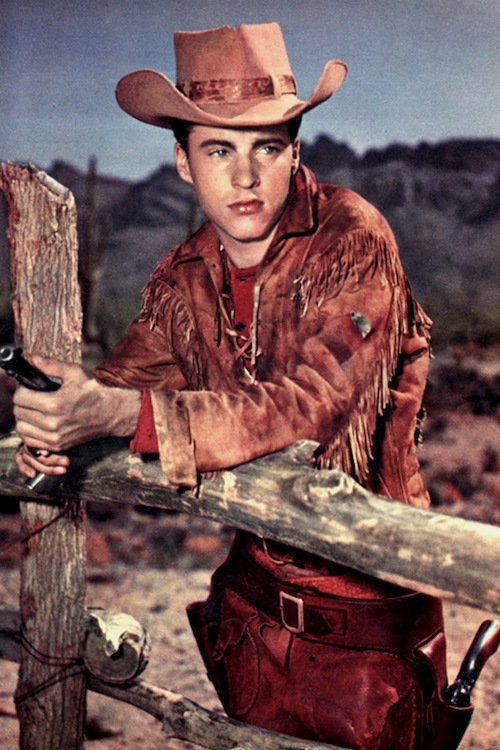 “That’s Ricky Nelson in Rio Bravo,” Presley quickly replied. 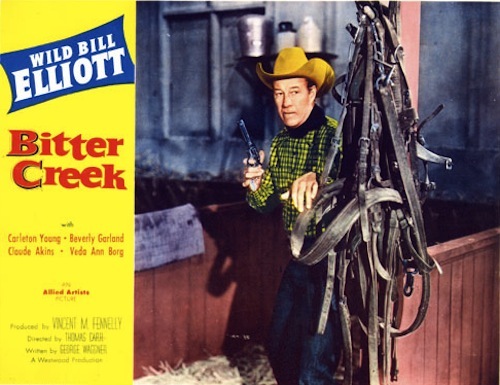 Wild Bill Wednesday #9 (50s Westerns DVD Rumor #176): William Elliott At Monogram And Allied Artists. Rumors of this one have been floating around for quite a while, but now it’s come from Warner Archive’s own Facebook page — so I feel safe passing it along. They’re working on a set of the 11 Westerns William Elliott made for Monogram (later Allied Artists) after leaving Republic. These were the Peaceable Man’s last cowboy pictures, and I’m a huge fan of them. The scripts, often by Daniel B. Ullman, and direction by the likes of Lewis Collins, along with the fact that the latter ones were shot to be shown 1.85, really take them up a notch — especially since the series Western was riding into the sunset by this time. Hopefully, this collection will help raise their status among fans of these kinds of films. To me, they’re essential stuff. By the way, Elliott followed these pictures with a solid series of detective pictures (already served up by Warner Archive) before retiring. Tim Holt Tuesday #12: Rio Grande Patrol (1950) Screening. On the third Thursday of most months, The Western Film Preservation Society has been running B Westerns at NC State’s McKimmon Center, here in Raleigh, since 1981. 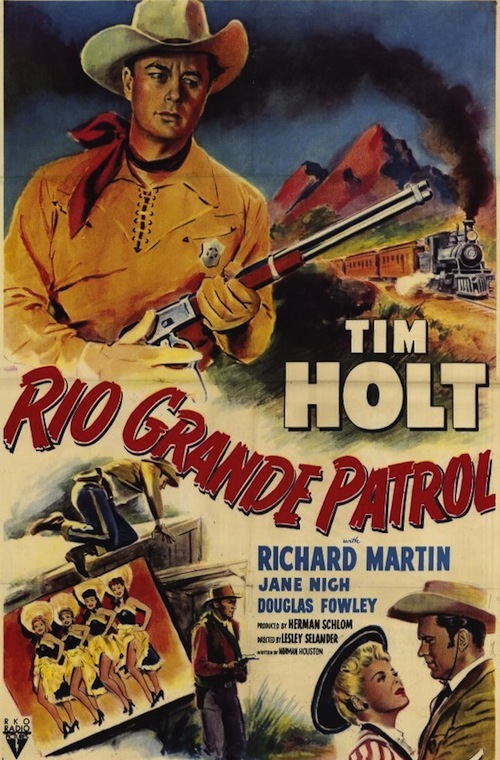 One of this week’s features is Rio Grande Patrol (1950), starring Tim Holt and Richard Martin (as Chito, of course). It was directed by the great Lesley Selander. The meetings get going at 6:45. 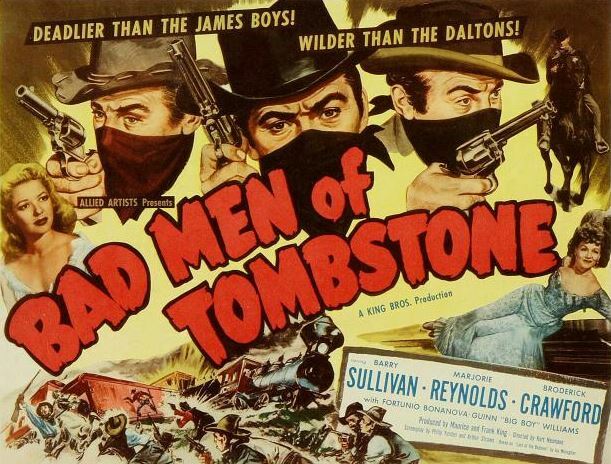 50s Westerns DVD News #175: Bad Men Of Tombstone (1949). We’ve know about this one for a while, but I’ve been meaning to give it a post all its own. Bad Men Of Tombstone (1949) will make its way to DVD from Warner Archive on April 7. Kurt Neumann is probably best know for a handful of the Weissmuller Tarzan pictures and The Fly (1958, which he produced and directed). I’ve always found him a solid director, able to put every dollar of his limited budgets on the screen, and that certainly applies to his work on Bad Men Of Tombstone. Plus, I like Barry Sullivan in Westerns. Coming at the same time from Warner Archive is Seven Angry Men (1955) and Black Midnight (1949). 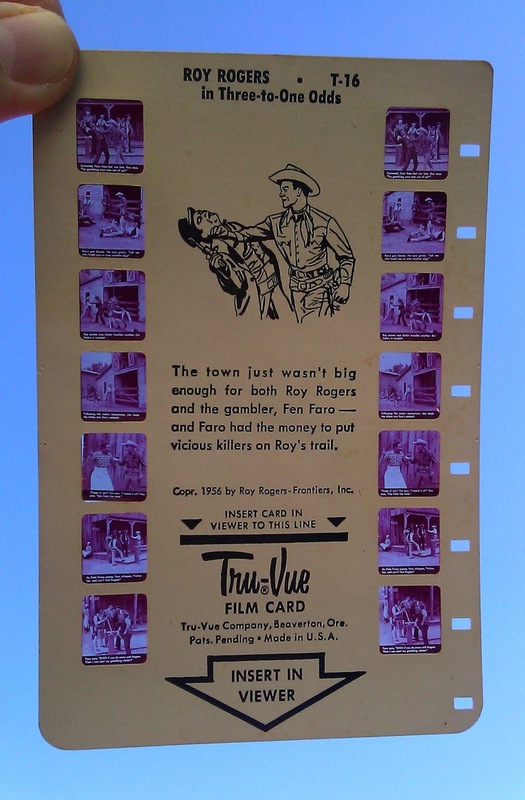 Look what my wife found at the flea market today — a Roy Rogers Tru-Vue film card. You know, there’s nothing cooler than Roy Rogers merchandise. If I won the lottery, that’s how I’d spend my time and money, collecting Rogers stuff.